As the recognized leader of decking contractors, we are specialized in building custom-designed decks in Plano and the surrounding areas. Northstar excels in building decks and professional deck installation. It's our passion. Additional services such as Arbors, pool decks and railings are also provided. 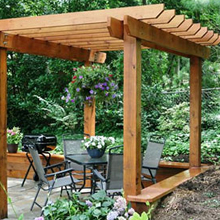 Northstar will turn your backyard or patio area into your very own private retreat. Beautiful decks add value to your home while creating memories for years to come. Contact Northstar today if you want the best, affordable deck money can buy... without breaking the bank.